Kaka Point is a 20 minute drive from Balclutha and 1 hour from Dunedin's International airport. It is becoming recognized as the ideal base for a total Catlins experience. This small seaside township with a permanent population of 200 is situated at the northern end of the rugged Catlins coast through which the Southern Scenic Highway travels. During holiday times the population increases by several hundred visitors who own or rent holiday houses. The region features sandy beaches, towering cliffs, rocky headlands, waterfalls, bush clad hills and farmland. 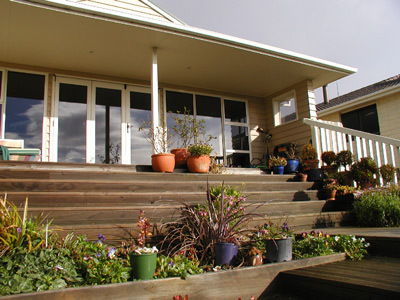 Our modern centrally heated house in Kaka Point is set in native bush and a garden where native birds including tuis and bellbirds can be seen feeding at certain times of the year. 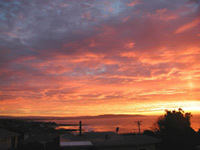 We have panoramic rural and coastal views. It is only two minutes walk to the beach, licensed restaurant, bar and shop. There is also a Department of Conservation reserve and bush walk close by. Janice and Brian have lived in the area for more than 35 years and have been involved in conservation in the Catlins during that time. At the Nugget Point Scientific Reserve, a 15 minute drive away, we are planting native trees and shrubs for the Department of Conservation. These are propagated and grown in our small nursery from seeds collected in the reserve. This planting is to further protect the rare yellow eyed penguins that prefer to nest away and out of sight of other breeding pairs. We also are involved in assisting the Yellow Eyed Penguin Trust with trapping for stoats and other predators which attack eggs and chicks. Sea Lions Other bird life too is abundant with various gulls, shags, gannets, royal spoonbills and sooty shearwaters breeding offshore on the rocky stacks and a large colony of fur seals can be viewed on the rocks below. Sea lions haul out on the sandy beaches. 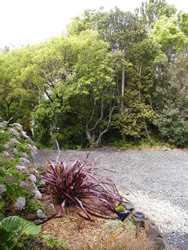 Our wider interests include art (please visit the Gallery section of this website), gardening using mainly native plants, tramping, and visiting other parts of New Zealand. Our participation in Department of Conservation volunteer projects has given us further opportunity to meet other people with like interests, and assist in the preservation of our unique natural heritage. We offer a choice of two rooms with either a queen sized bed or twin beds catering for one party only. Guests have their own private entrance, and ensuite. Secure off street parking is available. A homemade continental breakfast is included. Please contact us for futher information and bookings.